Numbness and tingling in the arms and legs, which feel worse during exercise, might involve nerve compression, nerve injury or nerve degradation. While largely touted as beneficial to most chronic conditions, exercise often exacerbates certain neurological conditions such as stenosis, sciatica and herniated disks. Having these conditions does not automatically herald the end of your exercising days. Willingness to listen to your body during flare-ups and resting when necessary will allow you to manage your symptoms and maintain an active life. Stenosis refers to a narrowing of the spinal canal, often caused by the encroachment of bone and tissue around the spine. Most commonly, stenosis occurs in the lumbar, or lower spine, and the cervical or neck region. This condition places pressure on the nerves housed in the spinal column that feed the arms and legs. Numbness, tingling, cramps and pain in the extremities result, typically during exercise, walking or standing, and these symptoms diminish once the patient sits or curls up in the fetal position. Stenosis can be congenital, or caused by aging, falls, weak back muscles and poor posture. Treatment involves rest, as well as exercises to strengthen the muscles of the core and back. The piriformis is a small pear-shaped muscle tucked in under the glutes. Piriformis syndrome occurs when this muscle exerts pressure on the sciatic nerve. Those with piriformis syndrome feel numbness, tingling and pain in the legs during exercises such as running. In some cases, improper warm-up and inadequate stretching before and after exercise can cause piriformis syndrome because if the muscle gets too tight, it can go into spasm and stress the sciatic nerve. Piriformis syndrome responds well to stretching exercises that aim to release tension in the piriformis, hamstrings, glutes and hip extensor muscles. Small gel-filled disks sit between each back vertebra and function as shock absorbers for the spine, similar to the cartilage in your knee. Weightlifting exercises performed with improper technique can cause these disks to rupture, as can aging, accidents or poor posture. A disk can herniate anywhere in the spine, so numbness and tingling can occur in the neck, shoulders, arms, legs and feet. On the whole, herniated disks do not require surgery, according to website Spine Universe, and respond well to bed rest, ice and heat therapy, massage and medications. 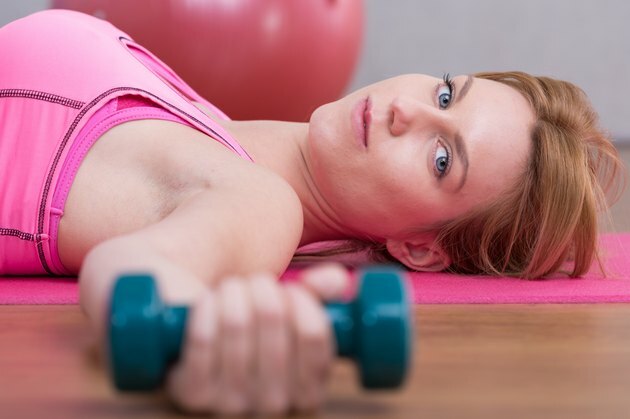 Active folks who encounter exercise-induced numbness and tingling might attempt to “walk it off” and push through the symptoms for the sake of their fitness goals. However, if ignored, conditions such as stenosis, piriformis syndrome and herniated disks can degenerate quickly into serious health complications such as loss of bladder control and loss of leg function. Seek medical attention if you experience numbness and tingling that intensify during exercise. Can I Walk on a Treadmill With a Herniated Disk?